Pasonomi VR 3 Made for Better VR Experience Take high quality headphones, Made for movie wathcing and play games with best experience Pasonomi VR 3 uses short-focus lens which can deeply magnify the image, making it closer to you; the 120 degree FOV makes the image fully displayed within the real sensible view of the eyes, letting you enjoy the VR world more immersively. Designed with a OK button, Pasonomi VR 3 makes you control games especially google cardboard games and apps like Fulldive easier. Wide Compatibility The phone cradle can be adjusted left and right and up and down, widely compatible with most 4- 6 inch smartphones in the market and making the screen located in the center of the view at the same time. For All Eyes Thanks to a fully adjustable focal (2.1"- 2.9") and object distance settings. When adjusted, the unreal 3D worlds look fresher, crisper, and more detailed than ever before. Comfort Fitting Wearing the headset feels comfortable and snug on your head due to a balanced design that redistributes the weight to relieve tension, stress, and pressure, ensuring you can use the headset for longer. When worn, the soft sponge casing further reduces pressure as well as providing more room for your face to breathe. A Safer, More Immersive Experience For improved usability, the plastic holder provides greater heat dissipation to protect your phone from overheating and damage. When it comes to getting a better view, an insertable 8-shaped shade cover stops light leakage while also optimizing the experience by standardizing framing across different apps. 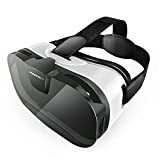 Note: You will randomly receive two different logo of the VR headset from our company, "Pasonomi" and "VOX", as we are adjust the brand recently,the fuction and quality are the same, please rest assured to use it. You can return or replace at anytime for this product. Lifetime warranty is promised! This new 3D VR GLASSES is specially designed for smart phones and can add great effect to the movie-going experience. It can be regarded as your private 3D Cinema and bring you great game experience. And, It is easy to use even by the youngest children or the old, you just need to put your cell phone into the relative slot of the item. And then, you can greatly enjoy the 3D movies or 3D games. It is perfectly suitable for students, white-collar worker or travelers, etc. Note: The working principle of 3D glasses is via split screen to reach 3D effect. Features: You will not feel visual fatigue and dizzy even you use long time with the resin lens The 3D Glasses is made of ABS and spherical resin lens materials without stimulation plastic sheet that is environmentally friendly, fully enclosed designed The distance between the phone and the lens design can be adjusted so that it suits for people with different visions Secret images, other people can not see anything except to the wearer himself Convenient to use for watching at anytime anywhere whether sitting, lying or standing Universal Compatible smartphone: 4.0-6.0 inch screen Android Devices: Samsung S3 S4 S5 S6 S6edge S6edge+ Note2 Note3, Note4 Note5 Blackberry, Sony, HTC, etc. 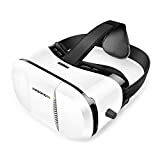 iOS Devices: iPhone 4/4S, iPhone 5/5S, iPhone 6 4.7, iPhone 6 Plus 6S Package Includes: 1 x 3D Virtual Reality Headset; 1 x User Manual; 1 x Cleaning Cloth; Sold by Pasonomi® US Store Pasonomi® is a registered trademark protected by US Trademark Law. 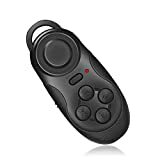 Multi-function remote controller with Bluetooth, controlling gamepad, cell phone, TV box, PC, etc. wirelessly. Specifications: Color: Classic Black Material: Plastic Interface type: USB Support system: IOS, Android, Iphone, PC, etc. Features: Mini design, portable and easy to carry around. Bluetooth V3.0, connecting wirelessly. 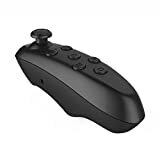 Multifunction: Gamepad Remote Controller Selfie Remote Shutter Wireless Mouse Music Player PC remote. 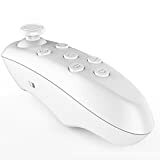 Package including: 1* multifunction remote controller 1* Instruction Manual Sold by Pasonomi® US Store Pasonomi® is a registered trademark protected by US Trademark Law.